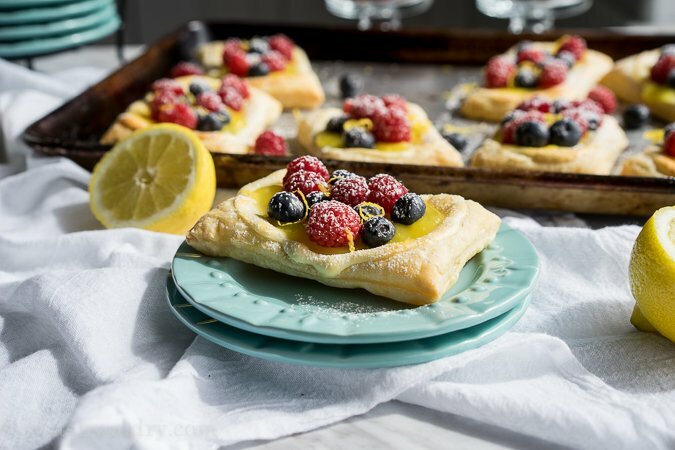 These Lemon Berry Cheesecake Puff Pastries are filled with a sweet lemon cheesecake then topped with a bright and cheery lemon curd then finished off with fresh berries and lemon zest. They’re so gorgeous, people will think you spent hours slaving away on them. When really, they are so simple you can throw them together in no time! You guys!! I just bought a big box of blueberries for .99 cents! Naturally I purchased several, because… .99 cents! Blueberries!! I’m a little excited about it. This is my favorite time of year. Berries are in season, lemons are put in everything, and babies! My dear friend Ashton (creator of the awesome blog, Something Swanky) is due to have a little boy very soon. So a bunch of us virtual blogging folks decided it would be best to throw her a surprise virtual baby shower!! Complete with food she will not be able to eat unless she makes it herself. 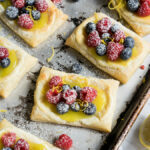 The good news, however, is that these adorable puff pastries are suuuuuuuper simple to make. I know she will love these pastries because she makes things like this, and this. Oh man, and these too! Yeah, she’s going to love these. So will you! Light and fluffy lemon cheesecake is baked on top of some once frozen puff pastry dough… so simple. The pastry dough puffs up around the edges for a light and flaky crust. 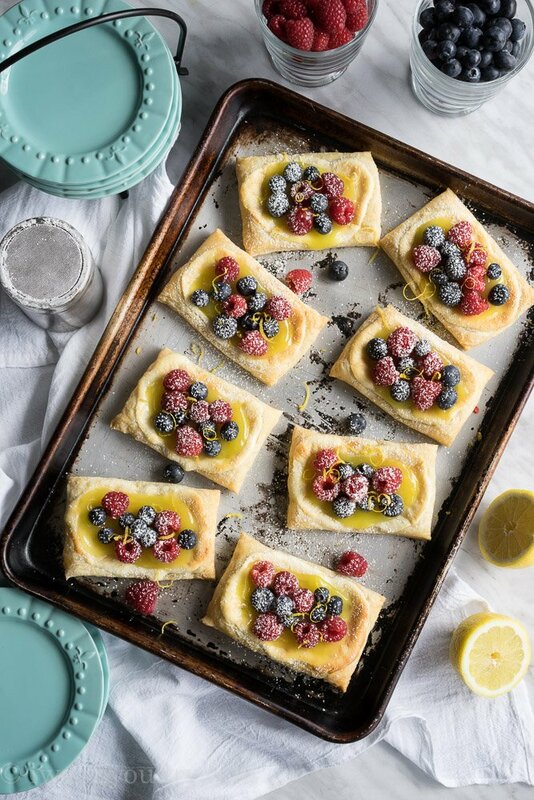 Once the cheesecakes are cooled you simply scoop on some jarred lemon curd, top it with fresh berries, a dusting of powdered sugar and some lemon zest for an extra punch of lemony flavor. They’re simply gorgeous, and taste phenomenal! Wouldn’t these be perfect for your next gathering? 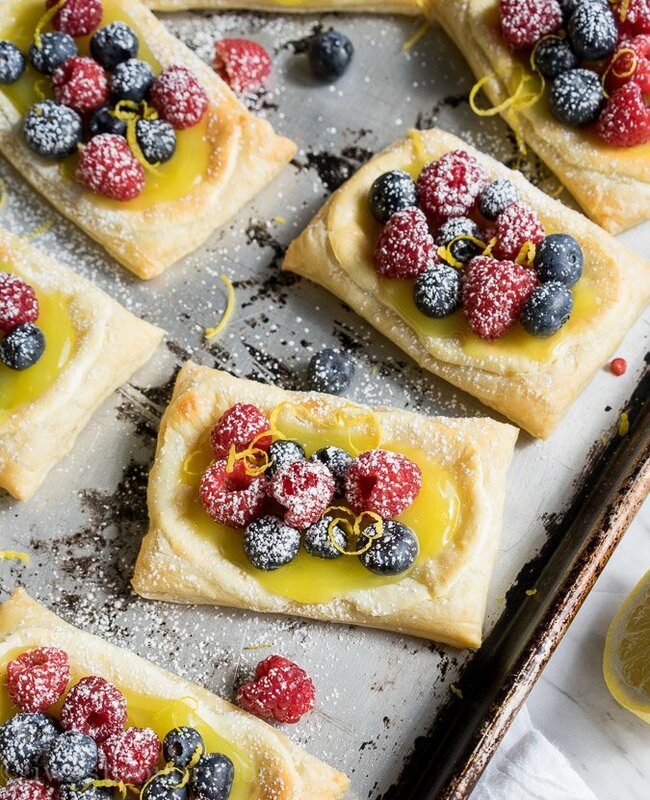 You could even just set out the baked puff pastry and let your guests fill them with all sorts of berries, jams, ice cream… I mean, c’mon! So easy! Don’t forget to check out all the other fantastic baby shower recipes (down below) that were made especially for Ashton’s sweet bundle of joy. 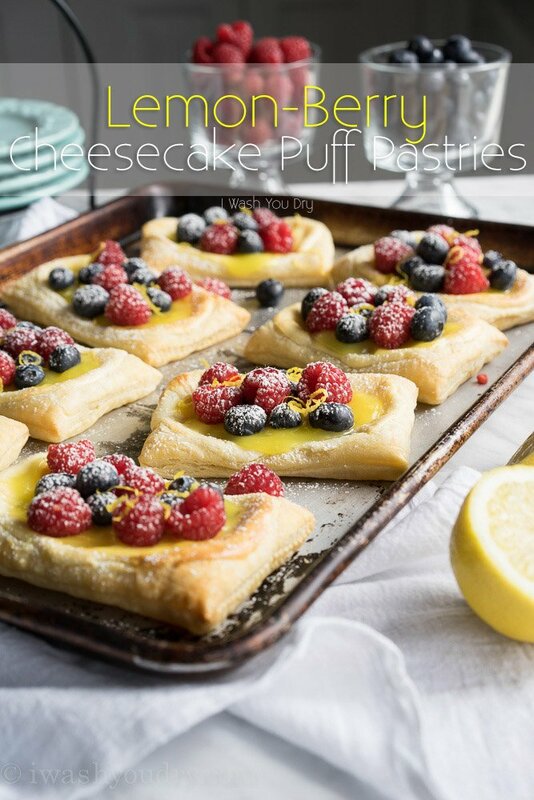 Lemon Berry Cheesecake Puff Pastries are filled with sweet lemon cheesecake and topped with fresh berries! Cut the both sheets of dough to make 12 small rectangles. Lay the dough on a parchment lined baking sheet. In a bowl beat the cream cheese, sugar, lemon zest, lemon juice and vanilla until smooth. Add the egg and beat until combined. Divide the cheesecake mixture among the 12 pastries, leaving space around the edges. Bake for 20 to 25 minutes, or until the pastries are a light golden brown. Let cool completely. Divide the lemon curd among the cooled pastries. Top with your desired fresh berries then dust with powdered sugar before serving. If desired, sprinkle with extra lemon zest for a nice pop of flavor. Keep chilled until ready to serve. 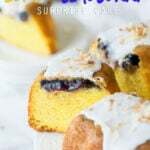 I’m making these for an Easter brunch and was wondering if they would be fine to make a day early and keep in the fridge? Or should I make them the day of? 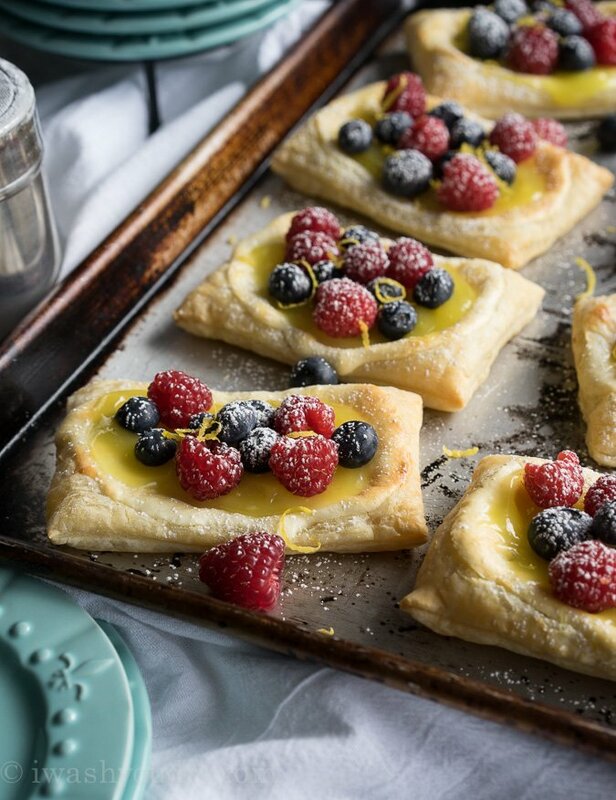 I love how super easy and delicious these little tarts are. The lemon-y berry flavour is perfect for Summer too! These look absolutely delish! I love the idea of adding fresh fruit! These look so lovely and delicious! Perfect for a baby shower. Congrats to Ashton!! These are absolutely gorgeous!!! I love how easy they are to make too! And lemon and berry is so perfect for this time of year! These are beautiful little pastries and they look delicious too. Wow, these are beautiful! 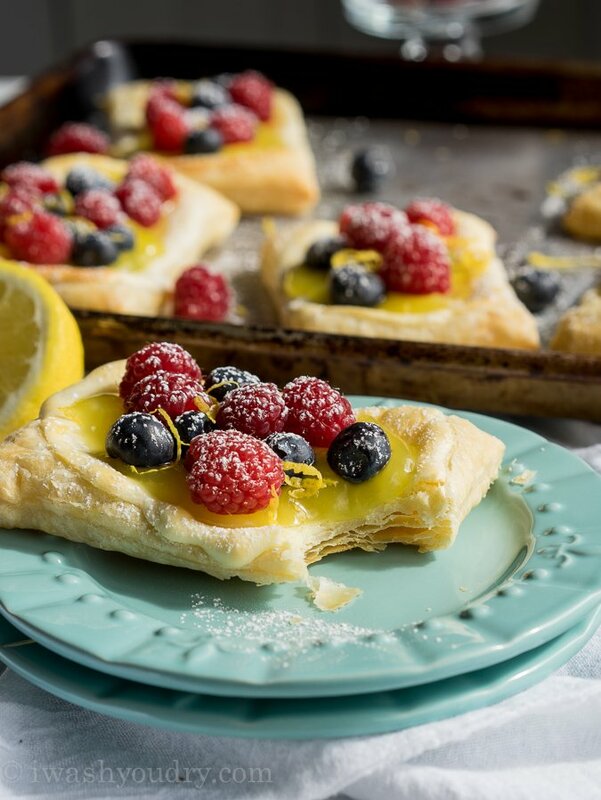 And they have some of my favorite things: lemon, berries, cream cheese and puff pastry! Can’t wait to make them! Oh, howI love a good pastry! These photos are gorgeous, Shawn! These are seriously beautiful, and perfect for entertaining! These are seriously perfect Shawn! Lemon, cream cheese, berry. I’m in love. Oh my word, this is SO clever! 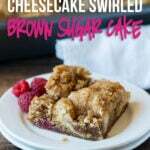 What an easy way to make single-serve cheesecake treats! And it really looks super pretty! Yay!! Thanks Ashton! I hope you had a special day! 🙂 Can’t wait to see that cute little boy! Definitely worthy of breakfast! 😉 Thanks Heather!